Many of you have probably seen the still photos of me playing this guitar. You might have seen a 15 second video on Instagram with a section of a song that I kinda got good at. 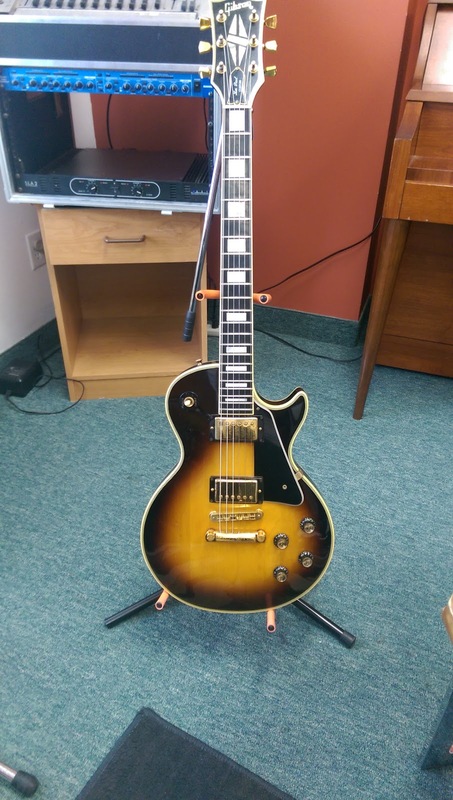 What you may not know is that this 1979 Gibson Les Paul Custom in Tobacco Sunburst is not mine. It belonged to my husband Paul who would have been 45 years on today (September 16). We were together during a time when you could truly avoid having your picture taken if you wanted to. Neither of us liked it so much; we both preferred to be behind the lens. So unfortunately, I don’t have any pictures of him playing the guitar except for those in my memories. I remember he tried to teach me a couple of times, but I always complained about how much it hurt my fingers. And I could never play a proper E chord. So I gave up. That was his thing, the guitar thing, the songwriting thing, the thing he did when he wasn’t chefing. My thing was listening to music, writing, and taking photographs of things where I couldn’t be seen. After he died, that guitar stayed on display. I didn’t touch it. I couldn’t. It was his. I wouldn’t let anyone else touch it, either. I moved out of that circle of musicians and chefs and things. When I rediscovered my writing craft and decided to make a more serious and concerted effort into making a go of this, I found myself moving in more creative circles once again. That included hanging with musicians. I kept looking at the Les Paul. I realized the shame and dishonour I was doing to that instrument by letting it sit there, in the corner, letting the wood dry, letting it collect dust. Paul would have never wanted that to happen, just as he would have never wanted his chefs knives to sit in a drawer and grow dull. So I made it my New Year’s Resolution in 2015 to learn to play the damn thing. And over the course of seven months, I think I’ve done all right. I’m not great. But I’m better than I was in the Spring, and I keep improving. I still can't play an E chord very well. And at first my fingers did indeed hurt, but I got used to it quickly. Sometimes you need to go through great pain before you can understand those things that are merely minor cuts and bruises. Paul loved the Blues and had books and tried to learn and play deep down south guitar blues. Well, I’m not quite ready for that. But he also loved Pink Floyd. And I did learn one song by them (it’s probably easy by Gilmour standards). So in that birthday tradition of gifts that don’t cost anything, I recorded a video of me playing (and singing) Wish You Were Here. I left in the mistakes. I’m not perfect at this, I’m no virtuoso. I’ve barely begun. But I wanted it to be authentic, like it would have been if I had taken lessons from him and learned how to play this on my own and then gone back and surprised him with it. So there are finger trips, missed beats, cracking voices. I left out the solos because I just kept tripping over them badly in every take, so there’s something I have to work on. Anyway, I hope you enjoy this little birthday gift I made for my late husband. I’m leaving it up on the public stream here for the next 48 hours. I’ll make it a private link or take it down after Thursday. I just hope wherever he is, he hasn’t been cringing while I’ve been learning. I hope he doesn’t mind his present. And I hope he’s laughing where I’m smirking at my rookie mistakes. Happy 45th birthday, Bobo. Wish You Were Here.